It's the perfect day for an egg hunt! This Easter is bright and beautiful with highs ranging from 60-78 degrees. It's the perfect day for an Easter egg hunt! 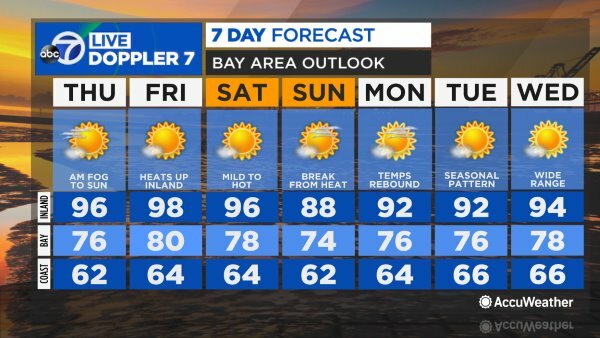 VIDEO: Weather Anchor Lisa Argen has your Bay Area AccuWeather forecast. Expect plenty of sunshine, winds to be on the light side and a warmer afternoon with highs in the low 60s to upper 70s. Highs: In the lower 60s. Highs: In the upper 70s. Lows: In the upper 40s. Highs: In the mid to upper 70s. HIGHS: In the upper 60s. Highs: In the mid 70s. Sunny & much warmer inland.